White Hart; Red Lion; Three Swans. to Stapleford, Deptford and all the adjacent towns and villages. Tuesday and Saturday; second Tuesday in every month for cheese. Tuesdays after January 6th, and 25th March, second Tuesday in September, second Tuesday after October 10th; for sheep, July 15th and October 30th. Salisbury is a parliamentary borough (two members) and a bishop’s see, in Wiltshire, at the terminus of a branch of the South Western line, 96 miles from London, on the rich green pastures of the Avon. Population 12,278. It is not an old town, compared with other sees, the original town called Old Sarum, being on the hill to the north of the present town. At this place a Cathedral was planted after the Conquest (for which that of Sherborne was deserted), but in 1220 another migration took place, and the present magnificent edifice was begun by Bishop Poore. It was for the most part finished in the course of 32 years, so that it has the great advantage of being not only uniform in design but offers a complete specimen of the style of that age, namely, early English. The shape is a double cross, from end to end 442 feet long; through the greater transept the width is 203 feet, and 147 through the less. The west front (which with the spire is of later date than the body) is 130 feet wide and 200 high, and ornamented with niches, turrets, tracery, &c., and a large painted window; the lower eastern window is a very handsome new one, placed as a memorial to the late dean; the upper eastern window is a very splendid one – subject, the “Brazen Serpent,” by Mortimer – the gift of a former Earl of Radnor. Above all rises a most beautiful steeple, consisting of a slender crocketted spire, 190 feet long, resting on a tower, which makes its total height from the ground above 400 feet. It is reported to be 22 inches out of the perpendicular; but whether or not it is a most imposing object from all points. There are said to be as many windows in the cathedral as days in the year. Several effigies and monuments are here – some as far back as the 11th century, transferred of course from the old cathedral. Among them are a boy bishop, and William de Long êpée (or Long-sword) son of Richard I., also Bishop Jewell, author of the Apology for the English church, and Harris, the author of Hermes, and ancestor of the Malmesbury family. The last is a work of Bacon’s; there are two by Flaxman. The cloisters are 190 feet square; they were restored by the late Bishop Denison. In the octagonal chapter house, besides the stained windows and carvings, there is a good library, the Salisbury Missal or Roman form of prayer, which was the model for all the rest, a carved table, &c., and an original copy of Magna Charta, At the large old palace is a series of portraits, beginning with Bishop Duppa of Charles I.‘s time. Both the cathedral and city were fully examined by the members of the archaeological visit in 1844. Most of the streets, except the main one from Fisherton Street, to Milford Hill, are laid out straight and regular, with rills 4 to 5 feet broad running through them from the Avon, Nadder, and Wiley; but unfortunately the city lies low, and, though its water meadows are pleasant to look at, the courts in which the poor livc are in a filthy state. The Council Chamber was built 1795 by Sir R. Taylor; portraits of James I., Queen Anne, &c. St. Thomas’s church is Gothic; it contains a carved monument of wood. Large county gaol at Fisherton, built 1822, St. Edmund’s Church, at the north-east corner of the city, was once collegiate. South of Milford Hill is St. Martin’s, and in the centre of the city stands St. Thomas’s. The churches are all about the same age. From the close behind the palace, an ancient bridge of the 13th century crosses the Avon to Hamham. There are two grammar schools; in that belonging to the city Addison was educated, at the Cathedral Grammar School in the close. He was born at Millston, higher up the river. 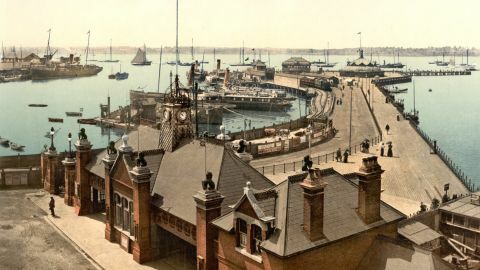 There are also several hospitals and charities; one being a college for the widows of clergymen, founded by Bishop Seth Ward, – another, a set of alms-house by Bishop Poore, – and a third, a hospital by Long sword’s wife, Ella. Two or three ancient wooden houses remain, which are curious specimens of ancient domestic architecture. In the Market Place, which was the scene of the execution of Buckingham, by order or Richard III., in 1483, is an ancient hexagonal Cross on pillars, called the Poultry Cross, built in Richard II.‘s reign. Chubb, the deistical writer, was a tallow chandler here. Shoes and excellent cutlery figure among the manufactures. There are many objects. of interest in the neighbourhood. At Stratford, near the ancient city, the Pitts had a seat; and in this way Old Sarum had the honour to be represented by the great Earl of Chatham. Trafalgar (4 miles), on the Avon, is the seat of Earl Nelson, bought for the family by Parliament, on the death of Nelson in 1805. At Clarendon (3 miles), once a royal forest, the “Constitutions of Clarendon” subjecting the clergy to the civil power, were enacted 1163; this led to Becket’s rebellion. 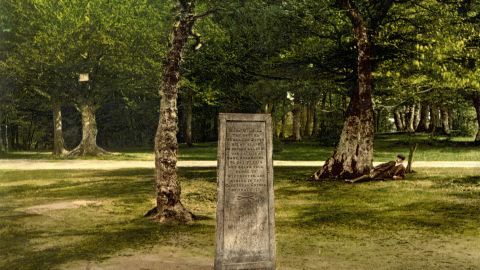 Clarendon Park, Sir F. Bathurst, Bart, Near this, an ancient boundary called Grime’s Ditch, may be traced along the hills into Dorset and Hants. Cranbome Chase, now enclosed, was to the south of it. There is an old church in the town; and at Tollard Royal is King John’s hunting seat. Longford Castle, the seat of the Earl of Radnor, was at first built (1591) in the shape of a triangle, in honour of the Trinity. Besides many interesting portraits, it contains a curious steel chair, covered with bus reliefs, illustrative of Roman history. Wardour Castle is Lord Arundel of Wardour’s seat, – a modern Grecian house in a large park, which contains the remains of a castle, famous in the civil war for the defence made in it by Lady Blanche and a few men against, the forces of Hungerford. There are several religious pieces and relics (the family being Roman Catholic), portraits, &c, and a handsome chapel. 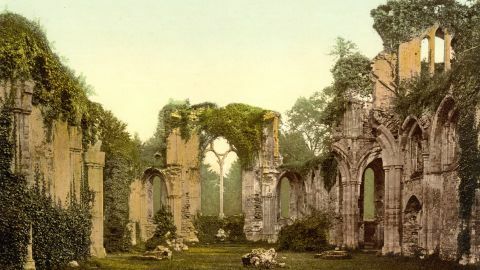 Fonthill Abbey, the largest park in the county, belongs to Alfred Morrison, Esq., but formerly the seat of Beckford, the author of that most original eastern story, “Caliph Vathek,” who here lived in the most selfish retirement, not seeing or being noticed by any one. Heytesbury (16 miles) on the Wiley, the seat of Lord Heytesbury, is a little decayed borough, with a collegiate church, and many barrows, etc, in the neighbourhood. Here these remains of antiquity begin to multiply, especially on Salisbury plain. Many were investigated by Mr. Cunningham a, draper, of Heytesbury. 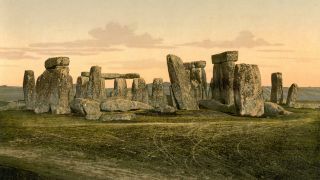 to whom Sir R. C. Hoare dedicated his “Ancient Wiltshire,” in which will be found the fullest account of these memorials. They are of various kinds and shapes. – round, oval square, etc. For warfare or burial (the barrows are usually craves), and have evidently been occupied by Britons, Romans, Saxons, etc., in succession, who attended them to suit their convenience. About 70 principal camps and stations may be counted, many of them ending in bury. Salisbury Plain is a turfy naked tract, 20 miles long east and west, almost as level as the sea, covered with sheep tracks, among which it is easy to lose oneself. The old coach road to the west of England crosses it; and the mail has been more than once dug out of the drift snow. In the winter of January 1854, a miller’s wagon was thus overwhelmed; the poor driver got out to look for the road and perished; had he been content to stay where he was, he would have been saved by next morning. It is 500 or 600 feet above the sea. In the flattest and most solitary part are the celebrated Druid circles of Stonehenge; two ovals inside two circles, can be pretty well traced, with the avenues leading to them. There are, or were, about 140 stones. The people say that it is impossible to count the same number twice over, and that it would be unlucky to count them right which must be a little discouraging to the schoolmaster. It has ever been considered the greatest wonder in the west of England, and many hundreds of strangers visit it annually. They are of a similar kind to those found on the Downs, where they lie about like sheep, under the name of Grey Wethers. Stonehenge is apt to disappoint the stranger at the first sight; and to some it is a trifle indeed. An American was once brought here by his friends, and made to shut his eyes as he drew near. Being placed under one of the Trilithons (one stone across the top of two others), was told to look up, but instead of expressing astonishment, he wondered that they should think anything of it. To him who had gone in large ships in full sail under a vast natural archway of rock, it was nothing; but a little while after, the sight, of Salisbury Cathedral, that glorious triumph of man’s skill, sent him into raptures. Vespasian’s camp and the circus (a round camp) are close to Amesbury, where there is an old church, and the seat of Sir E. Antrobus Bart. Avon hamlet lies two miles north-west of Salisbury. Wilbury Park, formerly Sir W. Cubitt’s seat, now Sir A. Malet’s, Bart. Millston was the birth-place of Addison, born in 1672; his father being the rector.